Former Seoul city Mayor Oh Se-hoon on Thursday declared his candidacy for leadership of the main opposition Liberty Korea Party despite lingering bitter sentiment against Oh in the party’s stronghold of the Yeongnam region. “It is time for us to surpass and overcome politician Park Geun-hye. I am well-aware that former President Park had saved our party twice. But we must overcome Park for conservative politics to rise again,” Oh said at the party’s headquarters in western Seoul. “We must no longer deny the impeachment, which was a judgement made by the public. As a president, Park deeply disappointed the public and party members. She did not use the authority entrusted by the public in accordance to constitutional values,” Oh added. Oh had served as Seoul mayor from 2006 to 2011. He had resigned in August 2011 during his second term, after a vote on his selective free school lunch policy failed to reach the minimum turnout required. Oh had said he would resign if the vote failed, but the move was criticized by the public and the party as a rash move. Before rejoining the party last November, Oh and his wife appeared on a cable channel’s reality TV show featuring married couples and visited the party’s traditional strongholds of Busan, Ulsan and Gyeongsang provinces. Major candidates in the bid for the Liberty Korea Party’s leadership post have come down to Oh, former Prime Minister Hwang Kyo-ahn and former party leader Hong Joon-pyo. Oh left the Liberty Korea Party in January 2017 in the midst of the influence-peddling scandal involving ousted President Park. 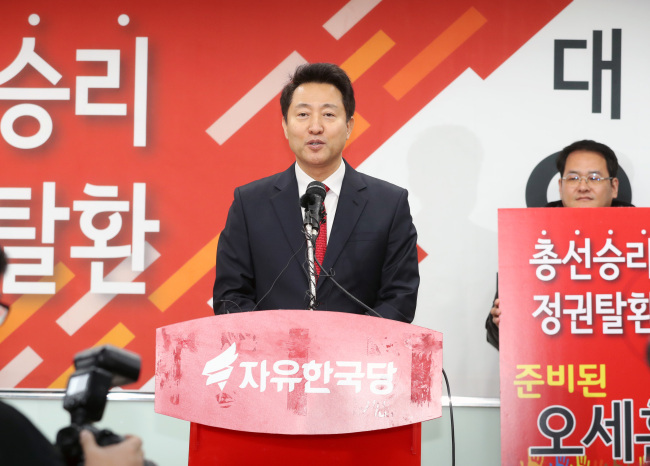 He then joined the minor conservative Bareun Party, but defected from the party before its merger with the minor liberal People’s Party in February 2018. His political moves came at the expense of losing the support of Liberty Korea Party members in the Yeongnam region, a conservative stronghold and core voter base. The Liberty Korea Party’s convention was initially set for Feb. 27 but it may be rescheduled due to the US-North Korea summit scheduled to take place from Feb. 27-28 in Vietnam.